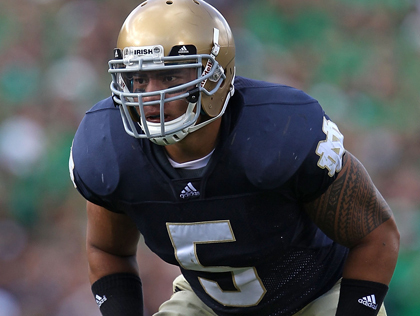 After yesterday’s frustrating and infuriating post I felt it important to lift our spirits with a story that is both heartwarming and heartening – and though it may seem like I have an overall demoralizing view of today’s youth, there are in fact reasons to be confident in some of our young people and Notre Dame linebacker Manti Te’o is a great example of why there is hope for today’s youth. Here is some background – he was an All-Everything recruit from Laie, HI (Punahou HS) whose rise to the upper echelon of the college football world was the combined result of a great football mind and out of this world physical talent. He was the most sought after recruit in the nation and many thought he would end up playing at a university on the western seaboard. He narrowed down his choices to Stanford, USC, BYU and Notre Dame. As a member of The Church of Jesus Christ of Latter-Day Saints and a longtime USC fan, there were no doubts that Te’o was either going to stay closer to home in the PAC-12 or BYU. Instead, he chose storied Notre Dame and in the four years since he put down roots in Indiana, far from the familiarity of his lush tropical home, Te’o has earned nearly every accolade and award known to football. He is quite possibly the best defensive player in college football and is a serious contender for the Heisman Trophy. Manti Te’o’s name is on the tip of every football analysts tongue. He generates news for all the right reasons. He is a breath of fresh air in a football climate that is known more for its coach and player scandals, player violations, parties, suspensions and look-at-me culture. Te’o is so popular for his on-the-field leadership and take-no-prisoners style of play that people now only have to refer to him by his first name. Only people like Prince, Madonna and Tupac have that kind of swag. And I have to be honest; Manti is much cooler than the aforementioned people both literally and figuratively. As amazing at it may sound considering the number of Heisman Trophy winners, All-American’s and NFL prospects that have played at Notre Dame, Te’o is now poised to be one of the most talked about and decorated players to ever suit up for the Fighting Irish. But it’s not the football praise that has impressed me most about this young man. In fact, I have done my absolute best to avoid even talking about how good a football player he is simply because I have a lifetime bias and incurable leanings towards PAC-12 teams. But it is almost impossible to articulate in words what it is that Te’o does as a human being away from the bright lights of the field and away from the invasive eye of the lens or the ever-present media that is ready to swoop and pounce on a high profile athletes every move and word. It is that Manti, the private, contemplative and thoughtful Manti that does things out of necessity. What Manti does for people springs from a desire to be a good human being, not just a good football player and that is what impresses and inspires me most about him. Tragedy can bring out the best or the worst in people. Trust me, I’ve had my fair share and so, I’m sure, have many of you reading this post. This year alone, Manti has had to deal simultaneously with the loss of his grandparents and his longtime girlfriend to cancer, a disease that has no restrictions on the people it affects. In moments of heartbreak we tend to turn to something or someone to ease the hurt and stymie the pain. It doesn’t matter what or who it is but we find comfort in that person or thing that we turn to when we need it most. It can buoy us up or it can destroy us. In those sensitive moments when we are most vulnerable and exposed our grief can reveal who we are as people. In the case of Manti Te’o it exposed him for who he truly is – a mature young man whose commitment to his God and his loved ones is admirable and infectious. His response to his sense of loss was so profound that it left talk show host Jim Rome, a man who is never at a loss for words, speechless. Rome was so impressed by Manti that in post interview comment he declared, “I’m almost speechless… I’m not sure that I’ve had a conversation….I certainly haven’t spoken with very many people who have experienced what he has experienced, much less have the conviction and the courage and the faith and the perspective to put it all in order. That was truly astonishing. That was beautiful.” Yes Jim, it’s a beautiful thing when young people have what we refer to as “Eternal Perspective” not just the tunnel vision that is preached to our youth by the media. In all honesty, I believe it didn’t require tragedy for Manti to display and communicate the man that he was raised to be – no, it just took that for people like me to see who Manti really is and the man that he is destined to become. Yes, I know I’m heaping on a lot of praise here, but having been around a lot of athletes, some of them really, really good athletes, I can tell you that it is really hard to be a good person when you’re surrounded by a lot of bad. I don’t know Manti personally but I do know members of his extended family and if Manti is anything like them he is every bit as God-fearing, humble, kind, supportive and respectful as he seems. If he can hold onto and espouse those qualities in the same engaging manner that has endeared him to the media and the world, than he has my vote for just about anything. Is he the real deal? You will have to watch and listen to decide for yourself. My son just gave his first talk in primary about Manti. I wish I could let Manti know that he is impacting lives everywhere…and on a variety of levels. My son’s topic? How to be a missionary now. Why on earth do they let Bramble near a football, will alyaws be one of those great unsolved mysteries.Sacking Roeder ain’t gonna change things, I think Newcastle have replaced far too many managers, leaving the team without any direction.If he’s replaced now, then Newcastle have effectively given up for this season, because the new guy will need time to adjust and bring in his own set of players.The best is to slog it out, make improvements in tactics and blooding younger players at the expense of non-performing regular ones, like Bramble, Ramage etc.Eventually, the injured players will take their place and let’s see how they perform. If Roeder cannot still get the results, then he should be sacked.Until then, the waiting game must continue.